Cheryl went red and now her Girls Aloud bandmate Kimberley Walsh has gone to the pink side. Kimbers unveiled her new bubblegum pink ‘do to her 245,000 Instagram followers on Tuesday morning. Striking a sultry pose to the camera, the star captioned the photo of her striking hair colour: ‘#newlook #summer #pink’. Maybe Kim’s sweet ‘do was inspired by the character of Frenchy in the film Grease, who was in the Pink Ladies, and shows off the stunning star’s green eyes. 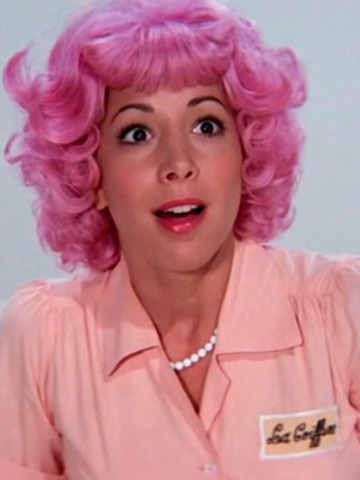 Did Kimberley look at Frenchy from Grease for inspiration? The 33-year-old singer is renowned for her shoulder length glossy caramel locks which she has maintained for a number of years. But it seems the yummy mummy wanted something of a change and decided to dye it a fun blush colour. Kim’s thousands of fans were tickled pink by the change and all praised the star for doing something radically different. Chezza’s BFF is in good company. A Lister’s Kaley Cuoco, Katy Perry, and Nicole Richie have all experimented with pink hair. Kim recently revealed her fella Justin Scott proposed to her in hospital straight after the birth of their son Bobby. And she shocked Girls Aloud fans when she said she put off getting engaged during her time in the band because she did not want to have bandmates Nadine Coyle and Sarah Harding as bridesmaids. She also tweeted about being on a shoot with pink flamingos and has started rehearsals for the musical Elf, which will hit the West End stage later this year. Wonder if Cheryl will now go all out and dye her tresses blue!